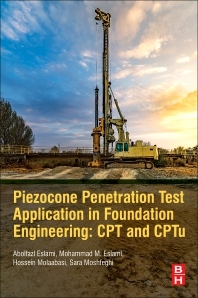 Piezocone Penetration and Cone Test Application in Foundation Engineering includes different approaches for determining the bearing capacity of shallow foundations, along with methods for determining pile bearing capacity and settlement concepts. The use of soft computing (GMDH) neural networks related to CPT records and Geotechnical parameters are also discussed. In addition, different cases regarding the behavior of foundation performance using case records, such as shallow foundation, deep soil improvement, soil behavior classification (SBC), and bearing capacity are also included. Abolfazl Eslami, Professor, Department of Geotechnical Engineering, Amirkabir University of Technology, Tehran, Iran. Hossein MolaAbasi, Assistant Professor, Department of Geotechnical Engineering, Gonbad University, Gonbad, Iran.